This book provides an understanding of what is necessary to properly understand change management with Kanban as well as how to apply it optimally in the workplace. The book emphasizes critical aspects, several traps which users repeatedly fall into, and presents some practical guidelines for Kanban change management to help avoid these traps. The authors have organized the book into three sections. The first section focuses on the foundations of Kanban, establishing the technical basis of Kanban and indicating the mechanisms required to enact change. In the second section, the authors explain the context of Kanban change management—the options for change, how they can be set in motion, and their consequences for a business. 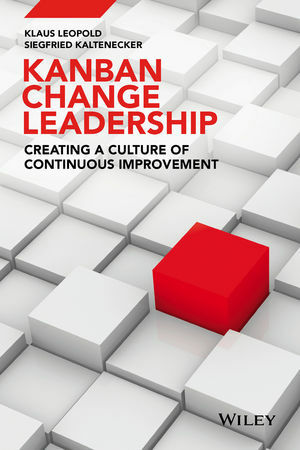 The third section takes the topics from the previous sections and relates them to the social system of business—the goal is to guide readers in the process of building a culture of continuousimprovement by reviewing real case studies and seeing how Kanban is applied in various situations. Kanban Change Leadership is an educational and comprehensive text for: software and systems engineers; IT project managers; commercial and industrial executives and managers; as well as anyone interested in Kanban. Klaus Leopold, PhD., is a computer scientist with extensive experience in helping IT organizations to manage knowledge work. Dr. Leopold is the managing partner of the company LEANability GmbH, based in Vienna, Austria. He is a founding member of Lean Kanban University, co-founder of the Limited WiP Society in Austria and Switzerland, a founding member of the management network Stoos, and author of the blog klausleopold.com. Siegfried Kaltenecker, PhD., is the managing partner of the company Loop Organizational Consulting GmbH, based in Vienna, Austria. As a change management and leadership expert, Dr. Kaltenecker has specialized in Process Management with Lean/Agile/Kanban/Scrum and has worked as a consultant and trainer for over twenty years for a variety of companies. He is the co-editor of "PAM—Platform for Agile Management" and co-author of “Leading Self-Organizing Teams”.